Slow cookers are among the most popular items on Amazon in terms of sales, and the reason is fairly obvious. We’re all so busy these days, and slow cookers make it so easy to just throw a meal together and then not have to worry about it while it cooks. If you’re in the market for an upgrade and you’ve been waiting for the right sale to jump on, your wait is over. 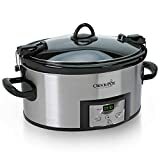 The Crock-Pot 6-Quart Programmable Cook & Carry Slow Cooker is an “Amazon’s Choice” product, meaning it’s among the most popular and well-reviewed models out there. It’s on sale right now at 41% off, but an extra $5 on-site coupon you can clip drops the price all the way down to just $30.50. Don’t miss this deal. How could you not get this popular robot vacuum for just $70?